Formed from the ashes of The Birds and TheBees and Fluff, IRONBRIDGE released their one and only album in 1973 on the then EMI International label. Having released no less than five singles under their name Fluff this Shropshire band made their final bid for the big time by changing their name to Ironbridge (the worlds first iron bridge had been built in the Shropshire town) and the album sold extremely well in France whilst gaining rave reviews. Now having achieved a cult status the album is released on CD for the very first time and the music today falls under the “power pop” category but at the time was described by reviewers as “somewhere between The Beatles and The Moody Blues”! Listening to this, we can't help but feel the guys in this band should've and could've had a long and rewarding career if they had chosen to stick to their guns. This album features twelve impossibly catchy pop/rock tracks that sound decidedly ahead of their time. We can hear traces of bands like Badfinger and Big Star in several of these songs. The melodies are smart and inventive, the lyrics insightful and true, and the vocals are just...outasight. This really is one of the great lost treasures out there in the world of music...and a whole new audience can now appreciate the songs of this obscure group. Kickass cuts include "Just A Day," "Making It Hard," "Simple Man," and "Shanty." This disc also includes the bonus track "Just A Day (Strings Version)." Great upbeat pop stuff... TOP PICK. 'Shanty' alone is worth the album, a brilliantly composed tale of the sea broken into segments. Starting out with a mere flute, the narrative voice sings of a ship about to embark on a voyage, with someone's sweetheart left behind on the quay and tears streaming down her face. These emotions are emphasized by melancholic guitar riffs, strings, punctuated keys, and an altogether floaty and dreamy quality. Gradually though, it all turns heavier and the dreamy quality makes place for excellent but hard riffs and keyboard sounds - obviously reflecting inner turmoil as well as the stormy sea. Once the musical climax is reached, the sound mellows and the narrative voice picks up again - singing of a sea that by now has calmed down, and of the ship heading back to the harbour while the Captain is looking older. Some delicate a-capella singing brings the voyage to an end. Simply fantastic! The album is a rarity indeed, and it's a bonus that Ironbridge songs don't sound the slightest bit rusty to the modern ear. ...The group's manager at the time Austin Powell, said 'We knew the LP has become something of a collector's item; copies were selling on eBay for around £40, but it was quite a surprise that Angel Air Records said they'd like to release the material on CD. We even found an alternative version of one of the tracks which has been put on the CD as a bonus'. This is a belting little gem. Shropshire's Fluff released only a handful of 45s between '69 and '72 before delivering this self-penned 12-track longplayer along with a swift name-change in '73. Ironbridge is bright and breezy, is unashamedly English in tone, and rings of early 70s Hollies in parts and Lost Chord Moodies in others. 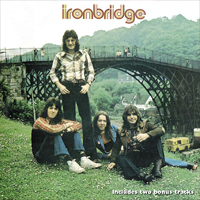 Ironbridge is a rather fine album...As a nice example of pop, folk, prog, and hard rock, this was well done and worth a listen if you didn't catch it the first time around. Once again, another nice job from Angel Air rescuing a lost gem from the vaults. Full story of the band and photos are included in the booklet as well. A band that was packing venues across Montgomeryshire in the early 1970's has finally had its CD released, nearly 40 years after it was initially made as an LP. The album may not trouble the top 40, but it does ensure a little piece of local musical history lives on.